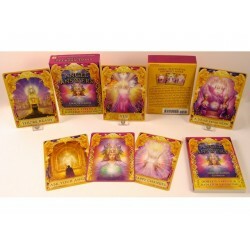 This card deck offers you trustworthy guidance when a short-but-sweet response is required. If you're navigating through a confusing situation, this card deck will yield straightforward answers to give you the clarity you're seeking. Doreen Virtue and Radleigh Valentine, the best-selling authors of Angel Tarot Cards, brings you a deck that cuts to the chase with the most pertinent information you need to know. The 44 beautifully illustrated cards come with step-by-step instructions in the accompanying guidebook. With Angel Answers Oracle Cards, you'll clearly receive your guardian angels' direct and loving messages.